Based on the 2011 novel by Ernest Cline, Ready Player One marks a much-welcome return to science fiction blockbuster fare for Steven Spielberg, a genre he'd helped bring to the public consciousness over the years with movies such as Close Encounters of the Third Kind, E.T., Jurassic Park and Minority Report. The fact that some of those works had served as inspiration for the source material only makes his choice as director here a no-brainer. The year is 2045, and our protagonist Wade Watts (Tye Sheridan) lives in the slums of Columbus, Ohio, known here as the stacks for the way its various mobile homes and trailers are stacked upon one another in true shanty town manner. Everyday life in the stacks is tough, and rather than face those challenges head on, Wade takes refuge in a virtual reality world called the OASIS, where he takes the form of his avatar, Parzival. It is a world of limitless possibilities, and one with the promise of a very special reward. Following the death of its creator, James Halliday (Mark Rylance), a message is broadcast to all users of the OASIS, revealing an elaborate Easter Egg hunt. In order to complete the hunt, players must complete three tasks while gathering clues from Halliday's past, a past that is heavily steeped in a love of 80s and 90s pop culture. The first person that discovers the Easter Egg would not only inherit Halliday's riches, but also assume complete control of the OASIS itself. And thus began the hunt for the Easter Egg, a hunt that's been going on for 5 years when the movie opens. Parzival is one of the many gunters (that's short for egg hunters) looking for the egg, and he is joined on this quest by best friend, Aech (Lena Waithe), love interest, Art3mis (Oliva Cooke), and fellow gunters, Daito (Win Morisaki) and Sho (Philip Zao). They'd collective come to be known as the High Five when they manage to beat the first task after Parzival cracks the clue hidden in one of Halliday's many recordings. This puts them on the radar of Nolan Sorrento (Ben Mendelsohn), CEO of IOI, a company that is willing to go to any lengths to gain control of the OASIS. 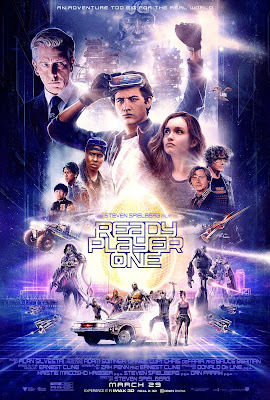 Much like last year's Blade Runner 2049, Ready Player One is a film worth experiencing on the largest available screen. I saw it in IMAX, and looking back, I can't imagine seeing it in any other format. The film is a visual spectacle; everything from the highspeed thrills of the first task, to the breathtaking final battle that surrounded the third one manages to one-up everything that came before. Even the quieter moments of the second task remains noteworthy for its photorealistic recreation of the Overlook Hotel from the Stephen King and Stanley Kubrick horror classic, The Shining. Ready Player One isn't merely a love letter to pop culture and video game history. It is a celebration of blockbuster filmmaking. It is Steven Spielberg proving once again that he knows how to dazzle with awe-inspiring visuals and action that put the Michael Bays of this world to shame. The fact that none of that comes at the expense of a thought-provoking narrative is icing on an already-delicious cake. And only Spielberg could've pulled it off so well. Have to watch it again to catch even half of the pop culture references. Indeed. The sheer number of Easter eggs was almost overwhelming. Hi Michael (it's been a while!). Just wondering whether you read the book? I was pretty disappointed by the film having already read it because I felt the film could have been so much more! As fate would have it, I only just started reading the book after seeing the movie, even though I've had it in my library for over a year now. I like what I've read so far, but nothing yet that makes me like the movie any less than I currently do.